Free 32oz growler with free beer on the first top up. Nice. Free coffee at the lobby. Beds are queen. Not king. All rooms claimed as non smoking but I smelled smoke in my given room. 20mins walk to the strip. Not bad. Guest parking is right in front of hotel. During our stay, saw 2 rooms were under renovation. Did not notice noise as we had a late check in n early check out. I stayed this hotel 40days ago during I travled alone US. They asked me depost 100doller. I booked two times this hotel. So they asked me 200 deposit by credit card. It's okay. It's insurance for their product in the room. I understand it. But when I check out I asked my deposit would be canceled, The staff my deposit will be turn back to my accoudt. BUT IT'S DIDN'T TURNED BACK. Even I cheked out 1and half months ago. So I called in my country called the hotel to ask about it. They just said my it was canceled. But I'm pretty sure that the lied. And I found out on review of this hotel on google map. There are so many people claimed that they didn't get their deposit. I was very disspointed about this hotel and US. My travel was good, but this dishonest business ruined my image of US. Probably they turned back deposit to navtive speak or group guests. But I think they didnt turn back foreinger who travel alone who is not native speak. Because they expected they would leave US soon. Staff were friendly. Price was right. Much lower resort fees than on the strip. Very close to the strip. It was a very easy walk to get there. There have been some nice renos in the rooms. The rooms would be much nicer and look more polished if the walls were also redone. Carpets in the hallway are gross and show the hotels age. Hallways are also very narrow. There was a growler bottle in our room with a coupon for a free fill. Nice touch! Lady in the karaoke bar didn't seem to be happy to fill it for us. She was quite grumpy. 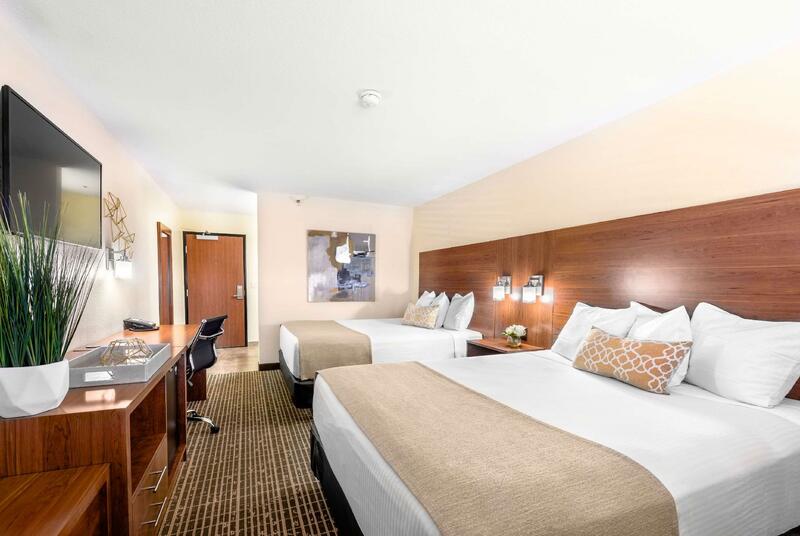 We wouldn't hesitate to stay here on our next trip to vegas. Just a block away from the Strip. Clean, quiet and comfy hotel. Casino right next door and a 7-11 which was very handy. Please improve on the airconditioning, it happened that the cool button didnt work and we had to open windows or stay outside to get some air. Lol. Other than that cool place! Its located in the strip area, affordable price, good dining! We only payed $143 for 2 nights king size bedrm. Will def choose this hotel again when we go back. We had a great stay at Super 8. It's a 10 minute walk to the strip and given there are no resort fees, it can't be beaten on price. The rooms were nice - huge, comfortable bed; big tv w/ cable; good shower and a/c. Worth noting that the pool is also 24 hrs (rare in Vegas). The staff were friendly and helpful and the attached casino, Ellis Island, is a great option for eating. The ribs are highly recommended. The stay also included a free daily breakfast which we missed every day up to the morning we left (warning: Vegas nights can sometimes turn into Vegas mornings/afternoons) and were pleasantly surprised by it considering the cost of a stay at super 8. Cereal, toast, waffles, yoghurt, coffee, orange juice. All in all, if looking for a budget option then Super 8 can't be beat. nice hotel, very clean and has pool. Free coffee in lobby. The room is clean but overall it is old. Need to have renovations. Carpets are terribly old and dusty. They charged me $17.99 resort fee/night & I told them as per Agoda voucher was shown "No Resort Fee". Then this hotel asked me to settle with Agoda. For me this hotel shall settle with Agoda, NOT ME! This is the issue between them and Agoda. But at last I called Agoda myself and Agoda said will refund to me. Although it is just around $25 per night ( without resort fee) but hotel condition and the way they handled the resort fee issue annoyed me. 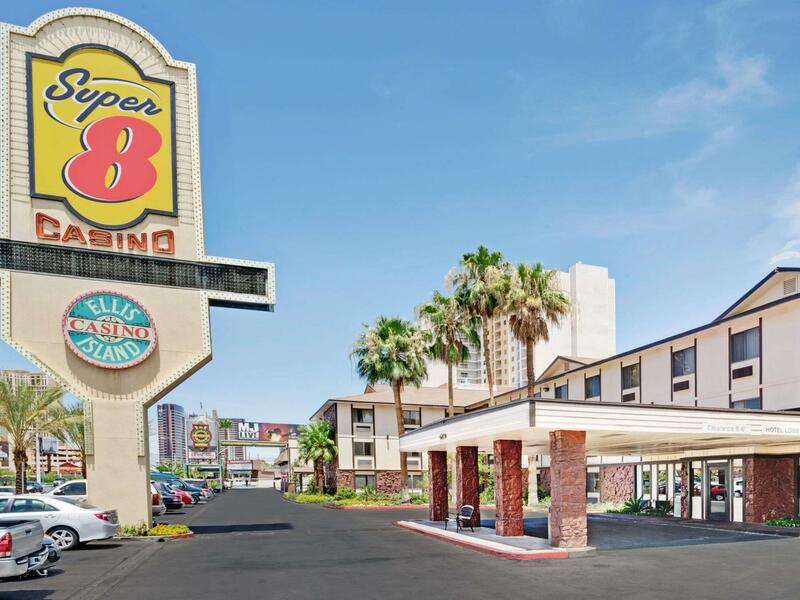 The hotel located around 15-20mins walking distance from the strip. I rather pay more and stay somewhere better and nearer to the strip. This hotel claimed that breakfast is included but now they said customer complained quality of breakfast & they provide $3 voucher to customers to redeem breakfast with difference prices $7.99, 4.99 & 2.99. For me it is just a scam. This is not so called INCLUDED BREAKFAST. I won't stay here again! Bathtub was rusty n gross.requested extra pillows n never received them.we got overcharged on our credit card n had to wait 7to 10 business days for our credit card to release our funds...that was a waste.registered for the wyndham rewards program n considering we booked to rooms for 3nights it states we have no points.wow!really?terrible! okay. breakfast is severely lacking...needs a lot of work. Also, the shuttle failed to pick me up for 1 hour, called them 3x for update and they never picked up the phone! So I had to take public transport. Never coming back again!! The two reasons I stayed at this hotel were the location and price. 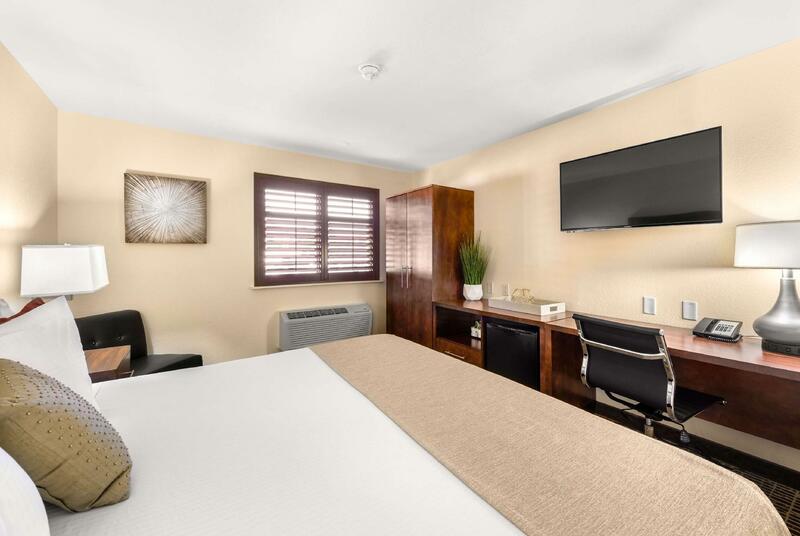 Are you looking for a decent hotel near the strip with a reasonable price on the weekend? This is it! You really can't beat the location! Close enough to walk to the strip. Convenience stores on the corner and small casino attached. Everything was good. Nothing was real bad, but nothing was super/amazing. It was clean enough, staff friendly, pool/hot tub open 24 hrs, very basic continental breakfast, and wifi worked. I was a little dated, but nothing seemed in serious disrepair. The biggest negative is the walls are pretty thin. I usually bring ear plugs anytime I travel and recommend everyone does the same. After they screwed up, I was upgraded at no extra cost to a suite. After they screwed up, they quickly tried to fix the problem. The Assistant Manager was very nice to me. Overall it was a positively dismal experience, due to the fact that I was charged for more than I was told, when I checked in. The rooms were sub-par but not great. The only redeeming quality of the establishment was the expediency with which they addressed their mistake. The room smelled like old dog poop & urine and the carpet was obviuosly stained. Doesn't look like the staff believes in shampooing carpets. And there was very little room for parking for hotel guests due to the casinio guest. My husband and I will NEVER stay there again! Very well located from the strip, the airport, restaurants, airport. Less than half a block away you have a all night Superette, you get anything from water, beer to OTC drugs, hot dogs to satisfy that midnight craving. Hotel room itself I must admit was fairly clean, but the furnishings and the place itself was very old. Stained Carpet in the hallway squeaking doors. The staff I must say, were extremely helpful and prompt with their service during our stay. The bed was comfortable and the shower was decent so no complaints there. The aircon in our room would make a really loud vibrating/rattling sound every 20 minutes or so and Im sure the staff would have moved us to another room if we asked, but since we were only here for two nights we decided- forget it. Of course in Vegas it could be said that one is rarely in the room except to sleep but the doors could really do with a little more soundproofing or perhaps the floor outside be padded better. Loud thumps of people running or walking or conversing in the corridor can be heard at all times which can become annoying. That aside, the adjacent casino has great food for what is relatively cheap in Vegas and they have $5 blackjack and roulette tables around the clock for those who want some action without the pain. This place is run-down, and caters to lower-income clientele. But i didn't check in to hang out with the rich. I just wanted to be close to the airport. The desk clerk was courteous and effective, as was the guard in the parking lot. All I needed was a bed and a bath and a quiet night's sleep. I got two out of three (young people banging doors and talking loudly at 3:00 AM). Not bad for fifty bucks or so. สถานีรถไฟโมโนเรล MGM Grand - ระยะ 1.14 กม.